We know: it’s unusual for pharmacy students to intern abroad. 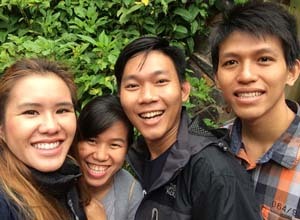 But Kristine wanted to do something different, and joined ELI Abroad in Da Lat, Vietnam. “The price with ELI was so great, and they were willing to work with my school to make sure I got academic credit,” Kristine says. An experienced ELI Abroad staffer acted as her preceptor, coordinating with ELI’s Vietnamese placement partners to ensure Kristine fulfilled all of her university’s internship requirements. Although she speaks Vietnamese, Kristine is quick to point out that anyone can do it. Some of the pharmacists spoke enough English to communicate, and coordinators that accompany interns also help translate. Da Lat is in many ways an ideal internship placement. Set in south Vietnam’s Central Highlands, it’s lush, much cooler than the rest of the country, and still retains the relaxed vibe of the popular resort getaway it used to be in the French colonial era. Kristine lived in a guest house, and often worked 6 day per week. Evenings and Sundays off were dedicated to exploring Da Lat and getting to know the people around her - coordinators, fellow staffers and other interns. The day began early - around 7:15 - and was filled with opportunities. The experience gave her invaluable insight into the realities of medicine in the developing world. It also exposed her to procedures she’d never seen before or heard about in school. In retrospect, Kristine has some advice for those considering interning in Da Lat. If you have a lab coat, bring it, or purchase one in Da Lat. Bring clothes that cover your legs and feet. Be professional: treat your internship seriously (this is more than an exotic adventure) and most of all, be engaged. “I firmly believe interns should be proactive, ask lots of questions and volunteer their skills.” she says emphatically. She remembers staffers were most responsive to those who actively sought out opportunities. Kristine also says, form relationships with the Vietnamese people. Since returning from her internship, Kristine’s been full of encouragement for others to give it a try. “Now everyone in my program wants to go to Vietnam,” she laughs. ELI Abroad says, bring 'em on!